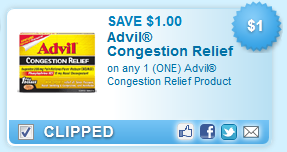 SAVE $1.00 on any 1 (ONE) Advil® Congestion Relief Product. This one is a money-maker! TOTAL COST - Free and $0.6 overage!